Why are we celebrating a dairy breakfast? Because the California Milk Advisory Board and I have teamed up to talk about the importance of a nutritious breakfast, that includes dairy. We want to remind you that, not only is the calcium in dairy important for growing strong bones, but it’s also packed full of protein. Last week I flew to Orlando to visit the Daily Buzz TV and talk about this very issue and share the recipe for my Southwest Baked Egg Cups with California cottage cheese and other varieties of California cheese. Check it out! Adding dairy to your breakfast, can help you from becoming hungry before your next meal. Kids who eat a nutritious breakfast may learn better and even do better in school, because they are less likely to have hunger pains, such as -being tired, getting headaches or even become cranky. The first step to making sure your kids eat a nutritious breakfast, is to set a good example, by making healthy food choices . Make sure YOU are eating breakfast. Keep simple grab-and -go foods on hand such as California cottage cheese and yogurt cups, string cheeses and fruit. You can even make a breakfast casserole, such has Southwest Baked Egg Cups or Creme Brulee Baked Oatmeal the night before. Store in the fridge, and simply heat in the microwave the next morning. Mornings can be a crazy time in any household, whether you have little ones to help get out the door, or not. Ease the morning scramble by getting everything ready the night before, such as: back packs, signed permission slips, lunches, even car keys and cell phones. Have them all gathered and in a designated spot, either by the front door or on a table. That way you avoid that morning panic when you can’t find a jacket or homework paper that is due. UPDATE: Giveaway has ended. Thanks to everyone who participated! 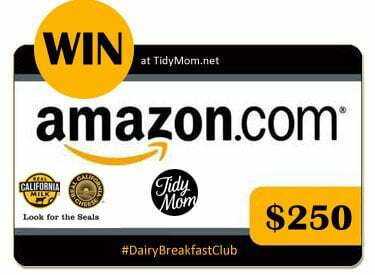 Since breakfast is an important part of starting your day off right, we have asked TidyMom readers to share their favorite breakfast recipes that include dairy, for a chance to win a $250 Amazon gift code!! ***BE SURE TO LEAVE A COMMENT FOR EACH RECIPE YOU LINK UP (up to 2) and a separate comment for each social media share – your comments are your entries! Official Rules: No purchase necessary. Must be over 18. 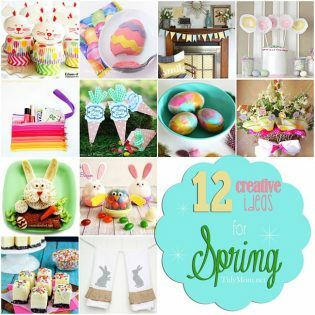 Giveaway will end on March 25, 2013 at 11:59 pm CST. One winner with a valid entry will be selected at random using random.org. 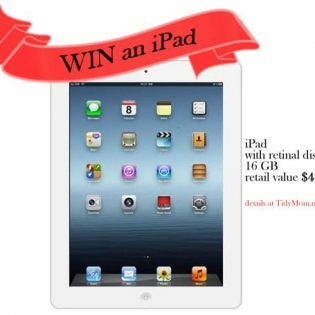 Winner will be notified by email and will have 48 hours to claim their prize or another winner will be selected. TidyMom is not responsible for lost or undelivered emails. Prize: $250 Amazon gift code. 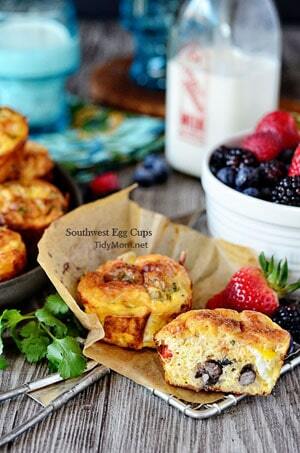 I don’t have a blog to link to but I love the baked egg breakfast cup recipe. I’ve been trying to think of more protein packed breakfasts for our kids. These are perfect because I am NOT a morning person and I can make them ahead of time! Thank you so much for the great recipe. Our favorite recipe breakfast recipe that includes dairy is a breakfast smoothie. Since it is a smoothie, it is also great to pair with a bagel or something else to get even more out of our breakfast meal. Throw everything in the blender and blend until everything is mixed! In a medium bowl, combine cream cheese, sugar, 1 tablespoon flour, egg and orange zest; beat until smooth. (Be sure to use the measurements found under filling for these.) Set aside. Stir together the glaze ingredients and set aside. Cream butter and sugar (1/2 cup) until fluffy. Add salt and vanilla. Add egg yolks (save the egg whites as you’ll need them later) to the sugar mixture; beat until creamy. Set aside. In another bowl, combine flour (1 1/2 cups) and baking powder. Add this mixture, alternately with milk to egg yolk mixture. Coat berries with 1 tablespoon flour and add them to the batter. In a separate bowl, beat egg whites until soft peaks form. Add sugar (1/4 cup), 1 tablespoon at a time, and beat until stiff peaks form. Fold egg whites into batter. Pour 1/2 into a floured and greased bread pan. Layer the filling over the batter and then finish with remainder of batter. This will create a layer of “cheesecake” between the blueberry batter. Pour glaze over top of unbaked loaf and bake at 350F for 55-60 minutes. I don’t have a blog but my recipe is simple, this is the smoothie I made every morning and so delicious. Combine all ingredients in a blender and blend until smooth. Serve immediately. It’s that easy! whoops, use 1 ½ cups cold Milk or Almond milk for those who can’t have dairy. I linked up my Whole Wheat Pumpkin Pie Pancakes. I linked up my Pumpkin Pie Waffles. 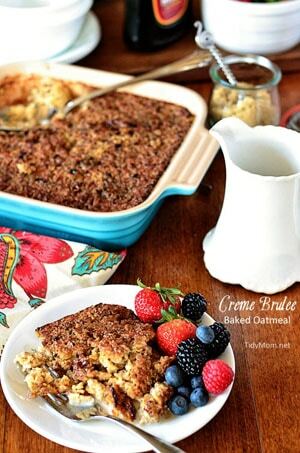 I love this strata, adapted from Smitten Kitchen! Sauté onion in butter until soft. Add pepper and just a dash of salt and continue cooking for one minute. Stir in spinach and remove from heat. Spread one third of the bread cubes in a greased (butter is best) 3-quart ceramic baking dish. Top with one-third of bread cubes, one-third of spinach mixture and one-third of each cheese. Repeat layering twice with remaining bread, spinach and cheese. Whisk eggs, milk, mustard and remaining some more salt & pepper together in a large bowl and pour evenly over strata. Cover with plastic wrap and chill strata for eat least 8 hours or up to a day. We like to make pancakes. The pancake mix is 2 cups milk, 2 cups flour, an egg, 3 tablespoons butter, a little baking powder, salt, sugar. Another breakfast recipe I like is milk oatmeal. I use quaker oatmeal, pinch of salt, milk 1.5 times the oatmeal, cook on medium low heat for 15 minutes, afterwards mix in a tablespoon of peanut butter, sprinkle some berries and banana slices. I left a link to an aunt’s Egg & Ham Overnight Casserole we love to make when having company. Very little morning fuss. I also left a link to a recipe on how to make The Best Scrambled Eggs. For years we tried duplicating my mother-in-laws wonderful eggs, and then she shared her “secrets”. You gotta try this! I shared my recipe for Vanilla Almond Granola in the widget above. I love to enjoy a bowl of this granola, made with Real California Butter, in a bowl with cold milk! I posted a pic of my recipe to Instagram. I’m new to Instagram so hope I did it right. I put the hash tag in a comment. Hope you can see it. I am sebh56 on Instagram. And…gave it some PIN action! We love these and love that they are from scratch! Beat egg in mixer until fluffy. Add milk and oil and mix well. Add dry ingredients and mix well. Fold in blueberries. Cook on stovetop on medium heat. Enjoy! Line the bottom of a 9×13 casserole dish with frozen tater tots. Beat about 1 dozen eggs with 1 c of milk, about 1/2 t onion or garlic powder (I like using both), salt & pepper to your taste. Sprinkle 1c or so shredded cheddar cheese topped with a generous amount of fresh spinach. Pour egg mixture over top of spinach & tater tots. Top with a 2-3 T of parmesan, preferably freshly grated. Bake until firm at 350 degrees. This is a very versatile recipe and you can add diced bell peppers or onions, crumbled bacon, ground sausage or even ground beef just to name a few options. Once cooled, cut into manageable sizes & grab for on the go. My kids say this recipe is even better if made the night before & eaten warmed in the morning. I linked up a sausage biscuit casserole! Linked up my Honey Wheat Bran Muffins. They are delicious and healthy! 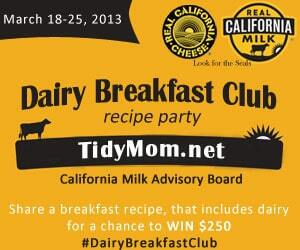 Breakfast and dairy are two of my favorite things! Heat oven to 350. Lightly grease 9 inch pan. Cut apple into small chunks. Whisk all wet ingredients, add dry ingredients (except spices). Stir in apple chunks. Mix spices with 2 tablespoons of melted butter. Add batter to pan, pour butter over top. Bake for 30-35 minutes (cover if getting too brown). Let stand for 15 minutes. Enjoy with a glass of milk or with mil poured over the top. Mix ricotta, chopped fresh basil, and a dash of salt and pepper. Toast english muffins. Heat 1 tablespoon of water in saucepan. When hot, add spinach to wilt. Heat a pan and saute tomatoes, add chopped basil and salt and pepper to taste. Fry eggs. If using canadian bacon, fry this as well. Put english muffins on plate. If using bacon, add this next. Put wilted spinach on top, add dollop of ricotta. Finish with an egg on top and chopped tomatoes on the side. Drizzle with olive oil.